The Dell PowerEdge M1000e with the M600 blade server delivers an affordable, entry level solution for customers interested in consolidating their server infrastructure, especially test or development environments. Aventis Systems offers the M1000e with the half-height M600 in half-populated configurations with 8 server blades, or fully-populated configurations with 16 server blades. Dell M-Series blade solutions start with the M1000e enclosure. A 10U enclosure, the M1000e shared infrastructure includes up to six hot-plug, redundant power supplies, up to nine hot-plug, redundant Energy Smart fans and one (redundant optional) Chassis Management Controller (CMC). The M1000e enclosure holds up to sixteen half-height server blades or eight full-height server blades. Up to three fully redundant interconnect I/O fabrics (Ethernet, Fibre Channel, etc.) are supported simultaneously within the enclosure through up to six interconnect I/O modules. The M600 features up to two Intel Xeon E5400 product family processors for up to four cores and 12MB cache per CPU. A capable memory footprint supports 8-DIMM memory capacity for a total of up to 64GB running at 667MHz. Storage options include up to two SAS or SATA hard drives or solid state drives. Aventis Systems includes the PERC 6/iR RAID controller standard with our M600 systems. Ethernet and fibre channel mezzanine network adapters allow for network flexibility and scalability for future requirements. Please browse our M1000e with M600 blades below! 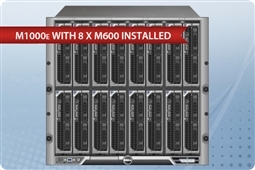 Aventis Systems carries Aventis Certified Reconditioned Dell PowerEdge M1000e with M600 Blades servers. All servers from Aventis System include a 3 year Comprehensive Warranty, with eligibility for optional Express warranties and onsite services. Are you looking for individual blade servers? Please browse our selection of Dell PowerEdge Blade Servers. Not sure where to start? Our knowledgeable sales and technical support teams are happy to help! Please use our Live Chat Live Chat or call us at 1.855.AVENTIS (283.6847) during regular business hours, or email us at Sales@AventisSystems.com.